Titan T96, is the slim type of the Titan T97, is cost effective and reliable. In addition to all the strengths of a T96, T96 offer a 20″ active TFT LCD screen, providing users with larger display area for more information. Put it at the heart of your high-performance portable computer solutions. Designed for field and mobile applications! The system’s integrated LCD offers a high-resolution flicker-free visual environment that rivals tradition CRT monitors. 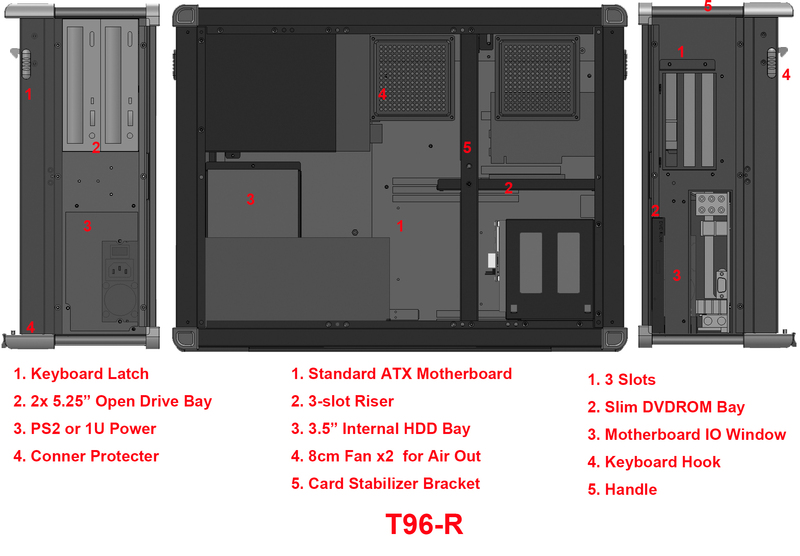 The Titan T96 has the capability to accept a maximum of seven expansion cards (motherboard dependent) along with two 5¼” open Drive bay, one 3½” internal and one one 3½” open drive bay, offering expansion capability unmatched by any other portable system. The all-aluminium Titan-T96 chassis is the ideal solution for applications such as portable servers, network/communications testing, field data acquisition, remote field service, exploration, factory monitoring/automation, new technology demonstration, and much more. T96 has a double card retention system that holds individual add-on cards securely at two points, with an adjustable pressure mechanism ensuring that half and full-length cards are secure during transportation. Titan T96 has 20.1″ industrial level of LCD built in it to provide you with large display area with crystal clear details. Previous models of our trans-portable computers required special custom shape power supplies. With the Titan-T96 could use any standard desktop power supply will fit this chassis so you can meet the varying power requirements of different motherboards now and in the future.